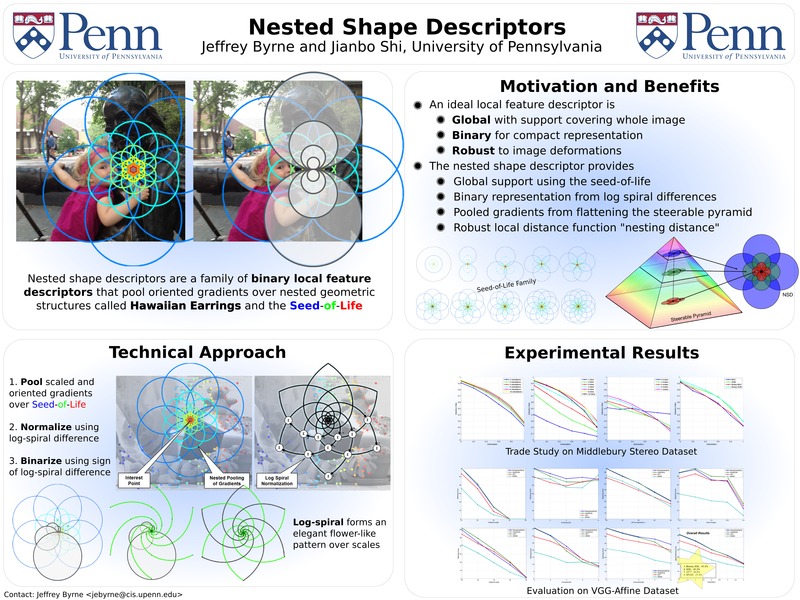 We propose a new family of binary local feature descriptors called nested shape descriptors. These descriptors are constructed by pooling oriented gradients over a large geometric structure called the Hawaiian earring, which is constructed with a nested correlation structure that enables a new robust local distance function called the nesting distance. This distance function is unique to the nested descriptor and provides robustness to outliers from order statistics. In this paper, we define the nested shape descriptor family and introduce a specific member called the seed-of-life descriptor. We perform a trade study to determine optimal descriptor parameters for the task of image matching. Finally, we evaluate performance compared to state-of-the-art local feature descriptors on the VGGAffine image matching benchmark, showing significant performance gains. Our descriptor is the first binary descriptor to outperform SIFT on this benchmark.